A mother and son huddle together in a cardboard box on Christmas Eve when a mysterious woman knocks on their door. They give her a place to sleep, a small cookie, and a coat for a blanket. On Christmas morning, an angel appears and changes their life forever. 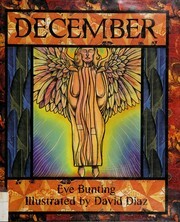 Bunting, Eve, “December,” Children's Picture Book Database at Miami University, accessed April 21, 2019, https://dlp.lib.miamioh.edu/picturebook/items/show/5961.